Pyeongchon Central Park is a park for men. And women. And children. It is a park for everybody and anybody. There is plenty to do for everybody and anybody: soccer, tennis, basketball, and even badminton. What!? BADMINTON!!?? Yep. You read that correctly. Pyeongchon Central Park in Anyang is a place where you can smack a birdie around. 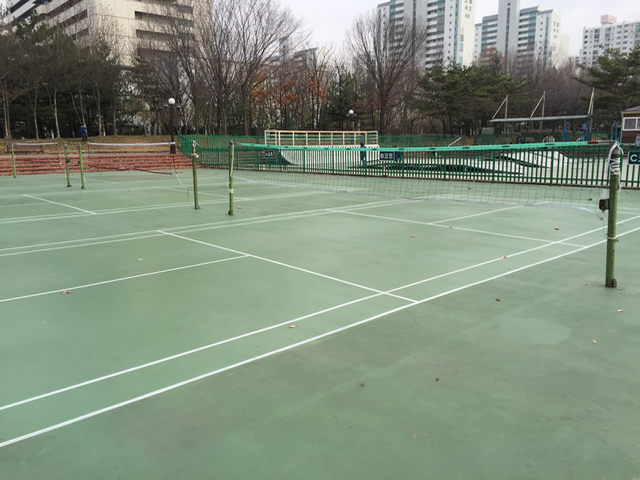 The badminton courts in Pyeongchon Central Park are in a very youthful corner of the park. They are directly adjacent to the old-yet-still-enjoyable X-Games skate park. 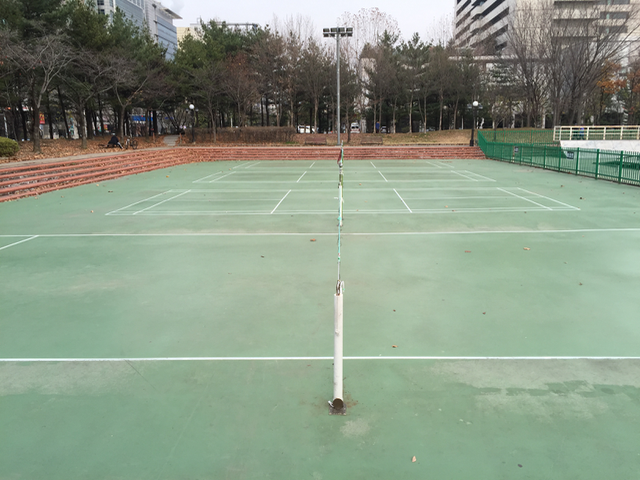 Maybe that is why there seems to be so much excitement around the badminton games here in one of Anyang's premier parks. There is no gravel or loose sand to worry about here. 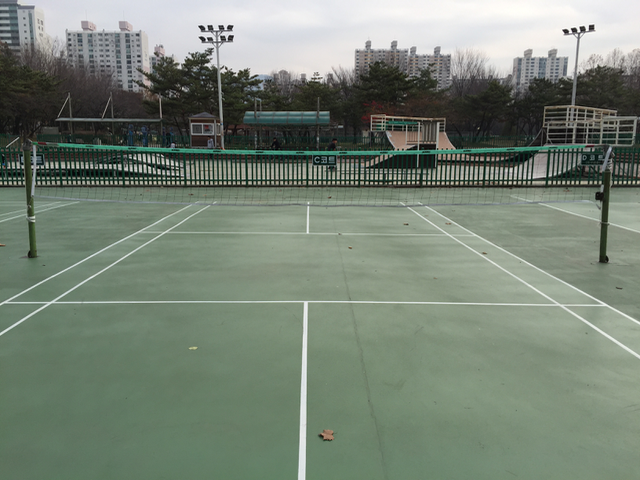 All three courts are properly topped with the same green asphalt that is typically found covering outdoor basketball courts in Seoul. The surface is in great condition. Nets are usually in place. Most of the time, you do not need to supply your own net. Michael Jordan does not play here. 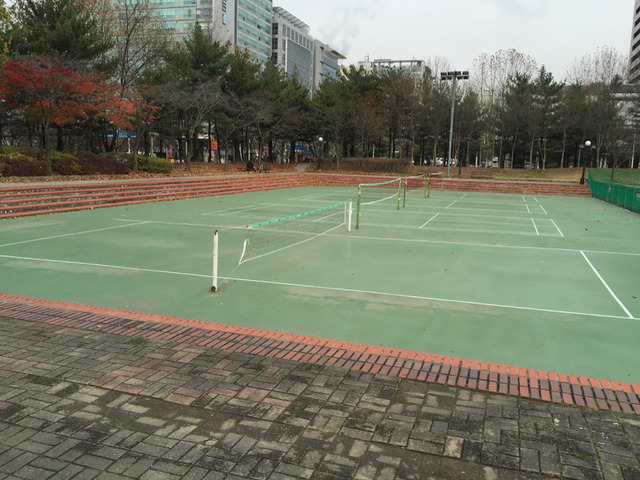 For that matter, there is no record of any member of the '92 Dream Team ever having been to Pyeongchon Central Park to play badminton. This badminton court is a thing of beauty. These courts are begging to be played on. To see more photos, check out the Pyeongchon Park photo album. -Walk for about 400 meters. The park will be on your right. -Once you reach the park, continue down the same road until you reach the end of the park. -You will find yourself in the same corner of the park as the badminton courts.